NFL betting expert Frank Taddeo hooks you up with the top plays in Vegas for the Conference Championship round of the NFL playoffs! Editor’s Note: This article was written by Frank Taddeo. I have been riding the Jaguars all season and have been pleasantly rewarded. Last week the Jags went to Pittsburgh and not only rewarded backers out here in Vegas by covering the 7.5 points but also helped punters in addition to myself cash money line tickets at +300 or higher at books all around town. Here is an interesting angle that I am not sure if being focused on enough—who works in the Jacksonville front office? Oh yes, that guy who is ‘Patriot kryptonite’ aka Tom Coughlin. Coughlin as head coach of the Giants is responsible for the only two Super Bowl losses of Tom Brady’s playing career. You think perhaps he will have a helping hand in the game plan for Sunday? As a betting man, let’s just say I wish the books out here in the desert would post on a line on it! Coughlin got after Brady and got him off his spot quite often in both NY Giants Superbowl victories with great defensive line scheme’s led by Strahan, Tuck, and company. Now, this Jags team brings arguably the NFL’s best defense into Foxboro to get after Brady this time around. I envision Jacksonville will employ Ramsey on Cooks and let AJ Bouye shadow, Amendola. The question comes in can Myles Jack with the help of Gibson over the top cover the biggest x-factor of the game—Gronk. Then the ultimate chess move I believe is when they line up Gronk out wide, and Ramsey takes him one on one that will leave Cooks to a nickel DB, and the question becomes can the Jags dominant pass rush get to Brady before the speedy Cooks gets open deep. The Jaguars pass rush got to the QB 55 times one off the NFL lead in 2017 and Brady was sacked 2+ times in each of his final six games of the regular season. Here is an important betting angle: Ready for this? Tom Brady has amazingly covered the spread 59% of every game he has played in his career! But did you know that when Brady is barely touched and sacked one or fewer times he covers the spread at a whopping 70% of the time–but when the great Brady is sacked >4 times his ability to cover the line here in desert falls drastically to become significantly less than a coin flip. Now as a bettor wins or losses are measured against the spread not straight up wins and in this game for the second straight game Jags backers are getting more than a touchdown from the bookies. Here is one worry heading into the game—I still have fresh in mind what Jimmy Garoppolo did to this defense last month and you know he employed much of what he learned from his days in NE en route to a 102.4 QB rating. I’m hoping that Christmas Eve game was just a ‘dead’ spot for a Jags team virtually locked into their playoff spot. I will once again follow the whispers here in Vegas that the sharps are backing the Jags real strong here in this spot—especially if this Brady (who did not practice Thursday) injury is worse than the Pats are letting on. The Vikings head into Philly fresh off the “Minnesota Miracle” as Stefon Diggs went high in the air on the sideline and sprinted into NFL Playoff lore in mere seconds—perhaps only topped by the Music City Miracle in 2000 & the Immaculate Reception in 1972. The Eagles enter fresh off sending the defending NFC Champion Atlanta Falcons home for the winter with a hard-fought fight best reserved for Broad Street. The Vikings as we highlighted last week will indeed make history here as no team before this season has ever played in the Super Bowl in their home stadium—the Vikings will accomplish that feat by heading back to the friendly confines of US Bank Stadium for SB LII. 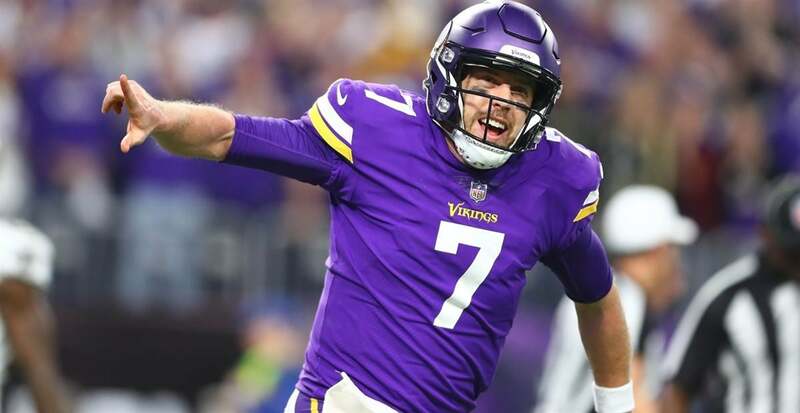 I love this betting angle: The Vikings making this history give the NFL a much-needed PR angle in the weeks leading up to the Superbowl as opposed to all the negative criticism that has accompanied the league with the kneeling of players during the national anthem. I don’t think this unique angle can be overlooked as we all know the NFL is big business and the ratings are down and this angle could very well change the focus of the media and the interest of the casual fans should we see the Vikings #BringItHome to the Twin Cities. Just picture this possibility out in Vegas in two weeks: the dog getting points “With” Home Field come Super Sunday??!! Can anyone say the biggest handle for the Vegas books in Superbowl history?! Sign me up. I know I am bucking a huge angle here of the #1 Seed at home getting points which is once again foreign territory for NFL bettors in this matchup. The fact that this line opened up at Vikings -3.5 and since seen significant money to move the line to -3 makes me hope that come kickoff this line drops to -2.5. Nonetheless, I am making sure I am on the side of the books in this one. No more analysis needed.